welcome back to EarningDiary. 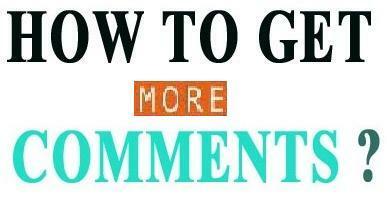 Today I am going to share a few tips that helps you to get more comments in your blog post. Just by following these simple but killer tips you can get lots of comments from your readers. This is one of the popular and easiest way to get comments.Ask your readers to share their experience related to your topic or you can ask them for some help. Another popular way to get comments. This trick not only help you get more comments but also it is an effective way to promote your site. But only writing quality comments can only help you to get more comments on your own post. So never write “great post”,”Thanks for sharing” etc. The main advantage of putting comments on a dofollow blog is that it helps to build links to your site. So make your blog Dofollow like our EarningDiary. Start a contest to reward your top commentators will help you get more comments. You can give away prizes like a free blog review, free plugins or free advertising space to them. This is a way to reward those readers who actively commenting on our blog. This plugin list the name of the top commentators on sidebar or footer with a link to their site. This trick also helps to get traffic to your site. My favorite blog Johnchow.com is using top commentator plugin. If you allow your commentators to subscribe your comments, hopefully they will get more involved in the conversation process. You can use subscribe to comments plugins to use this feature (for only WordPress user). If someone comment in your post you must reply to his comments.He/she may have some questions regarding your post he/she may have some doubts. You must help to clarify those doubts. If you would like to get get more comments in your blog post you must participate in this conversation process. Don’t forget to share your own way to get more comments on your blog post.